I read an article about this book in USA TODAY and thought I would give it a shot. I'm so glad I did. This book grabs you from the first page and does not let go! The twists and turns in this book are fascinating. You do not need to be computer literate to enjoy this book. The only downside to this book is that you have to wait until next year for the sequel. I'll be reading that for sure. If you want to start the year off with a terrific book, this is the one to read! I highly recommend it. This is a very helpful book for anyone who is beginning to blog and even for a person like me who has started to blog for about eight months but is still learning along the way. The authors give many websites where the reader can go to see exactly what the text is referring to. I finally learned the HTML code for doing lists in posts from this book. It also covers suggestions for getting traffic to your blog and how to get and handle comments. I highly recommend it for any blogger, especially beginners. Tuna is not safe for cats and you should not give tuna to your cats, even though they like it. I learned this at The Cat Lovers Site. I know I did a screen shot once before and posted it but forgot how and I didn't write the directions down so I looked it up at www.takeascreenshot.org and here is what I found: Hold ALT-Prt Scrn, then Ctrl-V to paste in "Paint" under all programs, Accessories. I knew it was very simple, but forgot I had to actually paste it into Paint. At My Crazy Life With A Toddler I found 13 handy uses for coffee filters besides for making coffee. One is to clean mirrors and windows because they are lint free. Another is to use at the bottom of pots to keep the soil from coming out through the drainage holes. This is just a couple that I will keep in mind. You may want to check out the whole list. I saw Mountain Woman from Red Pine Mountain is sharing her writing assignments with her readers so visit her blog to find out what the next writing assignment is. She invites her readers to do it along with her. The one I participated in was writing about a familiar place for you which is posted there now. Just thought I'd mention it in this post if you would like to read about it. You'll have to go there to find out what that place is; I'm not telling. Can you guess? This is a game I discovered at Wifely Steps. I thought it was fun and so asked if she'd mind if I started doing it on my blog too. She was okay with it as long as I changed the name so I thought I'd give it a try for Thursday posts. I'll know how much you like it by how many participate. What do you think is more important: being stylish or comfortable? You aren't against being community oriented, but it's not really your thing. You tend to prefer to focus on your family and not the neighborhood around you. 5) Fashion Fridays when Daisy & Harley model different outfits each week. It's funny that a person actually spends time doing all this in the first place, but Daisy's mom is very talented with the camera and wit. Sometimes there'll even be a funny video to watch. 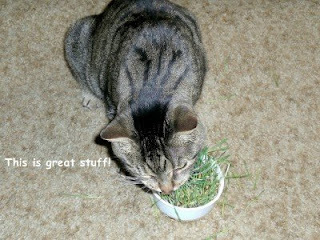 Anyone who has a cat would get attached to this blog. Another thing that amazes me about "Daisy, the Curly Cat" is that there's something new up early every morning. 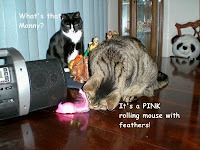 My cats blog too, but to come up with posts everyday by the cats is very difficult. After all, cats generally look out windows, eat, nap and if they're in the mood, may climb on something or play. 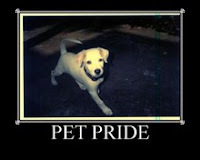 What makes this blog stand out from other "pet blogs" and "human" blogs is the extent of creativity that goes into it. Even if you don't particularly like cats, we think you'll appreciate the uniqueness of this blog. It is also a popular blog, getting 70-80 comments daily, which adds another dimension to it. The comments are fun to read too! Today I found a comment that says I won $10 in this contest--yippee! I know some of you have very popular blogs and may be awarded out or already received this one, so if you don't want to bother with it, I understand. But, I wanted to give it to blogs that I really look forward to reading every day so that's why I picked yours. 1) It is not necessary. What would happen if we didn't make the bed? Hmm. Nothing. It would absolutely make no difference at all! 2) In fact, it would save some time if we didn't make it. I could pet my cats a few minutes longer or be on the computer a few minutes longer before going off to work. 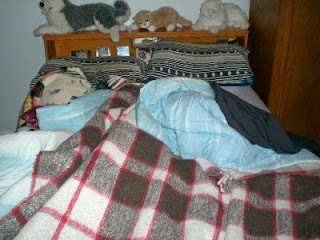 3) At night, we could actually get into bed faster! 4) No one is home through the day except the cats, and I'm sure they wouldn't mind if it wasn't made. It's not like we have company coming over every day. 5) According to a post at Mommy's Little Corner, it would be better not to make the bed because by leaving pillows and mattresses uncovered and exposed to direct sunlight and fresh dry air, it reduces dust mite populations by dehydrating the critters, which crave moist and warm areas. So, maybe one of my New Year's Resolutions should have been not to make the bed every day. The problem is that I was raised to do it. It does look better made but that really doesn't matter much since no one sees it through the day anyhow. Maybe I can force myself to break this bad habit I have of making the bed. I don't think Gerard would go for it though, being the neat freak that he is when it comes to the house. Maybe it's worth a try though. Can you think of any good reason why we should make the bed everyday? What unnecessary things do you find yourself doing every day? Self-Control stops--say "That's Enough For Now." This last characteristic of the fruit of the Spirit is about mastery, authority and boundaries. It's not a question of what? but of how much? In I Corinthians 6:19-20, our bodies are referred to as the temple of the Holy Ghost in us. Therefore, we need to take good care of our bodies to glorify God. We must not be mastered by anything according to I Corinthians 6:12 which says: Everything is permissible for me--but not everything is beneficial. Everything is permissible for me, but I will not be mastered [controlled] by anything. This could be a variety of things that control us. Some people struggle with all kinds of addictions such as smoking, drugs, alcohol, food, TV, the Internet, gambling. My struggle is the last two I mentioned. According to I Corinthians 6:12, a little bit is okay (although not necessarily beneficial--the implication being we should choose things that are beneficial). I must keep my guard up and exercise self-control in the amount of time I spend on the computer that takes me away from more beneficial things and keep a set limit for playing that football pool! Moderation is the key here. Instead of eating a whole pizza at once, which I easily could do, especially while watching TV, I limit myself to just two slices and save the rest for another day. Beth used the example of Samson and Daniel to contrast a person who did not have self-control and one who did. Although Samson finally brought glory to God in his death, Daniel did it in his life as we are told to do in I Corinthians 10:31: Whether therefore ye eat, or drink or whatsoever ye do, do all to the glory of God. Each morning we choose who we will serve--God or ourselves. "All sin boils down to an issue of authority. His will, or my will?" One point Beth made I felt was really good is that "any day not surrendered to the Spirit is virtually surrendered to the flesh by simple default!" That is why it is so important for us to seek God at the beginning of each day, confessing our sin, pouring out our concerns and asking God to fill us with His Holy Spirit so we can live beyond ourselves, letting Christ live through us! (see Galatians 2:20). Then through the day we should pray and praise God. At night, reflect on our day and see how God has worked. What a marvelous and practical study this was! I highly recommend it!! God has so much for us when we completely surrender ourselves to Him! I finally worked up my nerve to try adding CommentLuv to this blog when I was off on Monday. In the process, I learned how to export and import my blog into a test blog. I started the process with the test blog but I couldn't get it verified on the CommentLuv site so I just used this blog then. It worked! I was happy. I followed the video step-by-step that Alan had directed me to. It seemed to be going along fine. It should only take about 13 minutes. HA! When I was almost done, I didn't like the comment form or the way it looked. It didn't show the commenters' pictures and when I tried clicking on their name, it didn't take me to their blog. Nor did any last post show for anyone. I tried leaving a comment and I got the message that it didn't match my member ID. At this point, I was very frustrated having spent an hour trying to do this and I tried contacting the support help. When that didn't work, I gave up. I like the way my comments are working now and so I'm going to leave it as is. I don't know what happened. Perhaps I'll try again some time but I doubt it. I just don't think it's worth it. Perhaps it didn't work because I forgot to create my JS-Kit profile. That part wasn't mentioned in the video so I forgot about it by the time I had worked through everything. I just saw it now when I was looking for the link to the post in case you wanted to give it a try. 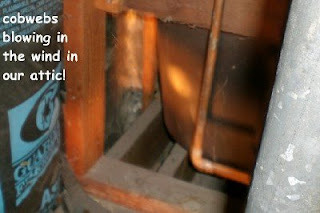 I learned which pipes go to our upstairs bathroom and how to shut off the water to them thanks to the plumber. Now I need to find someone to insulate our attic properly. I learned geocaching is a sport where you hunt for something hidden by someone else. There is actually a website (www.geocaching.com) where the players log in their finds. Then you can trade an item for something that you found by leaving something small of equal or greater value and re-hiding the container for someone else to find. This is the first I've ever heard of such a thing! Check out What Is Geocaching for more information about it. I found a directory for cats with blogs when visiting 3 Cat Blog. If your cat has a blog, you may want to head over there and sign it up. There is also one for dogs with blogs too! Angel, at Health and Happiness and Signe Says recently nominated me for the Lemonade Award. Thank you very much for the nomination, This is one, I really appreciate because The Lemonade Award is for sites that show gratitude and a wonderful attitude. I think that’s a good group to belong to! This has been one unusual week for us. 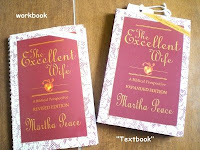 I was looking forward to starting my new Bible Study at church on "The Excellent Wife" by Martha Peace when the snow came at rush hour. My husband called when he got home 20 minutes later than usual to tell me how bad the roads were. I knew he didn't want me going out to church. He told me it would probably be canceled and I should call the church to make sure they were still having it before going. Having started reading the book, I read about how our husbands should be our first ministry. That's right, even above Bible studies! I also had just finished reading how important it is to show respect for our husbands by being submissive to them and that being submissive is a good thing. God has placed the husband over the wife for the wife's protection. So, naturally, when I was talking with Gerard on the phone, in the back of my mind, these words kept coming up. I called the church as he suggested and found that it was still on. I asked the church secretary to give Nora the message that I wouldn't be there tonight because my husband didn't want me to go and I was being an "excellent wife." I knew she'd understand. As it turned out, my bus was very late and running very slow. I got home at 7:15 and the Bible Study started at 7 p.m. It took me two hours and 15 minutes to get home from work. Even though I felt bad I missed the first discussion on this book, I had peace about it because I knew in my heart that I honored my husband and did the right thing. Getting home that late just made it much easier to accept. God is good! It was in single digits today, extremely cold out with snow all over. When I was having my morning devotions, I heard my husband yell, "Oh NO!" I came down to find that his lens popped out of his glasses. He stuck it back in. 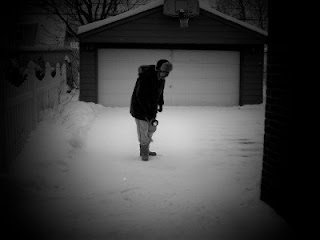 However, after taking the garbage out and scraping the ice off his car, he noticed it was out again when he came inside. He was very upset and was determined to go to work anyway. Again, what I had just read in "The Excellent Wife" popped into my head. Be a "Suitable helper" to your husband. Tha is my calling. So, I gently begged him not do drive with only one lens and said I'd go look for it at least. He ate while I took the flashlight and looked in the snow where he had walked while asking God to please help me find it. Well, I didnt find it. I gave Gerard two suggestions: (1) I would take off work too and we would go get him new glasses today and he could go in later if he wanted to; or (2) he could ride to work with his boss who lives just a few house up the street and wear his sunglasses all day and go get new ones for him that evening. I was glad he had calmed down enough to choose the first option. He got new glasses and I didn't have to wait for the bus on this frigid cold day. We both went to workout during the afternoon rather than having to go out at night. He didn't go into work because it was well into the afternoon before the glasses were ready. At least he got them the same day though and said he can see better now. Things seem bigger! Perhaps this was God's way of getting us to finally spend the money for his new glasses. Fortunately, he had the prescription he got just last summer so he didn't need an eye appointment. I thank God that it happened at the beginning of the day rather than when he was at work or driving. What a blessing! When I went to give the cats fresh water from our bathroom off the den, no cold water came out, just the hot. This happened before and after a few tries it worked, so I tried again . . . and again . . . and again. Ooops, I'm thinking, oh no. It must be frozen. I hope our pipes don't break. I called our regular plumber (we seem to have plumbing problems often) and he confirmed my fear. He said there's nothing he can do until someone gets home, but he would come tonight if it still wasn't working. When Gerard got home from work, he called the plumber and he arrived just after I got in. The bad news is that we need to get our attic which contains our upstairs pipes insulated this spring, but the good news is that our pipes didn't break. He just turned off the water going up there so it wouldn't happen again and said when we want it back on to call him and he'd come over and get it back on for us. We can easily manage without using that bathroom for a couple months. Praise God he watches out for us and for once, I did something right! This is a picture of me when I first got home from work on Friday. It was a very, very burry cold day outside with the high temperature of just 7 degrees! It was -10 when I left in the morning! Even though that is very cold, I was comfortable. The secret is to bundle up and dress for the weather. 1. 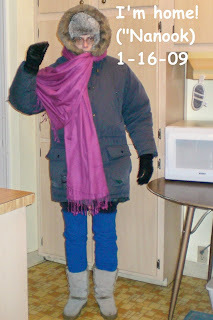 Wear lots of layers, a warm hat, a coat that covers your hips (not just a short jacket), boots, and leg warmers. 2. If you lose some weight, don't get rid of all those big clothes. Save some to wear over layers during those real cold days. bomber hat from L.L. Bean which is very warm, better than a knit tousle cap! Oops, I goofed. There's was an error in the title of this video so I redid it. Who will be the first to spot it? Can you tell I like L.L. Bean? This is NOT a paid post. I really like their merchandise. Sunday School can be very boring. I remember my early years hearing the same stories over and over, often with the same flannelgraph year after year. When I started teaching Sunday School, I determined not to ever have it become boring. If I get bored, I know the kids are bored. One method I found to liven things up now and then is to let the kids use puppets to review the lesson. The video below is one my 5th grade boys Sunday School class made this morning using finger puppets to review the lesson. They liked doing it and I think they did a good job on it considering it was only their first time and we only had about 10 minutes to do it. I added the titles in later. The lesson was on Acts 4:32-5:11. Too bad we only had four there today, but that way everyone got to do a puppet. I wish more came because I think they would have enjoyed it. What do you think? I always viewed gentleness like a gentle giant or a powerful horse under control. After this week of in-depth study, I discovered it is much, much more! According to Beth Moore's "Living Beyond Yourself" study, Gentleness (NIV)/Meekness (KJV) can be summed up to mean "cease fighting God." The Greek word translated as gentleness is praotes meaning: an acceptance of God's dealings with us, calmness toward God in particular, complete surrender to God's will and way in your life, responsibility with power. 2) Humility-This results from being rightly related to God and aggressive confession of sin. The Hebrew word translated as "humble" is Kana meaning "to bend the knee." The physical posture of bowing down before God can have a great impact on our spiritual stature. 3) Teachability-The gentle person is willing to receive instruction. She gave Paul, Aquilla and Priscilla and Apollos as examples of this using Acts 18. David accepted tragedy and failure as a challenge to search God's Word (see Psalm 119). Also, we teach others with a servant attitude. I liked the line about using the Sword of the Spirit to fight Satan, not the believers! God's teachers are bound to God's opinion, the only one which truly matters because God's word is absolute truth and only God's word can sanctify believers (see John 17:17). Daisy, The Curly Cat a visit. This is our favorite blog of all because it's often funny and Daisy's brother, Harley, looks kind of like our Moe. We both read this every morning before work. I sent two packages. One on November 26 via media mail and the person still has not received it. The other I sent to the winner of my contest on "My Funny Dad, Harry" blog, Abelle from Only In Silence who lives in the Philippines on December 13, first-class. In both cases I was told it should arrive within 10 business days. It is well past that and I feel awful because they haven't received it. I guess I should have sent it priority instead or at the very least requested confirmation. From now on, I will when sending packages. (I finally got an email from Abelle last Friday saying she finally got it and she read the book in 3 days! 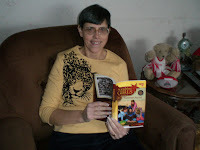 Visit her blog to read her wonderful review at My Funny Dad, Harry--A Review.) UPDATE: The one I sent on Nov. 26 finally arrived on January 17! What's up with the U.S. Post Office???? I learned about a comprehensive Personality quiz at Mira's Web Journal. It's free at www.Learn Myself.com and you can post a brief overview to your blog or My Space or with a link to the full report! Pretty Cool, huh? Clara at Coming Back To Life shared photos of her trip to Ft. McHenry in Baltiore, MD. This is the first I heard of this place and like seeing places like this. This was where Francis Scott Key penned the words to what later became our National Anthem. Her pictures of her grandkids enjoying this trip are very fun to see! It brought back memories of when we went to see historical places. Everyday Living had a great post, Tips To Copy-Protect your Content, giving lots of suggestions for copy-protecting your blog and what to do if others copy your work without permission. Some sites suggested to use are: www.copyscape.com, http://myfreecopyright.com, http://creativecommons.org. At Heresy Today I saw a very good slogan that is in the blog header: Don't blame God for the actions of His "Fan Club." Many people use the excuse that Christians are a bunch of hypocrites for not believing in God, which may be true to some degree but certainly isn't a good reason not to believe. I really like this slogan. Hope you enjoy my year in review. The "Things I Learned This Week" Friday posts were quite popular so I plan on continuing those. Another "standard" feature that I am considering doing is "Stupid Things We Did." It seems this happens pretty often and I'm thinking it might make for some funny posts. In 2008 I tried to post something every day, but in 2009, although I will still post frequently, I am going to try to have good quality posts more consistently and so I am not going to put pressure on myself to post every single day. This was a great gift which I got a lot of use out of since I blog. This was my first post using it. Take Away The Guns Already! This is just something I feel strongly about and since it was posted early while my blog was still pretty new, I decided to include it here. I know a lot of you like to read so felt this post was worth listing here. Shelfari is a great site for readers (and authors). This post explains all about it. This is my favorite post which documents our first weeks with Manny. Be sure to view the last video and turn up the volume. I am pleased to report the Manny and I are now good friends. He follows me all over the house, lays on me while I watch TV from the couch and has even started coming on our bed with us at night. He now lets me pet him without hissing, growling and sometimes even without squawking. Just thought this post should be included because it was done way back in June about Gerard. Our readers seem to enjoy hearing things about him so I included this here. This place is just unbelievable and since I know many of our readers like cats, I wanted to make sure you saw this! 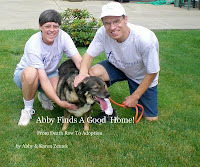 This is a very good site all about pets with lots of interaction and opportunity to help shelters. I wanted to make sure you knew about it so am including it in this list. Over 300 Pounds and Down to 140! This is just so remarkable to me. It shows what determination Gerard is made of. The picture at the bottom is one of my favorites of him with our cat, Moe, on his lap. This is sort of a core post for us because it's about our marriage and the changes we made so am including it in this list. This was one of the best "trips" we took in 2008. Cedar Point was the other one. This is one of my few lengthy more serious posts, but I added a picture of me at the bottom of it handing out the candy in 2008. Just had to include one of the videos I did with Spunky talking in it. I thought this one was pretty cute. If you aren't following my blog yet, I hope you will in 2009. You can do that through Facebook by clicking on that Facebook widget on my right sidebar or join my followers at the top left of the page. In my short time of being part of the blogosphere I have come across many great blogs and nice people. Mary, at Mother Nos Best has bestowed the Sisterhood award upon me. 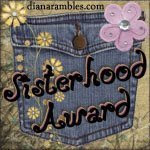 The Sisterhood award is inspired by the Sisterhood of the Traveling Pants and was created by Diana to be given to your best bloggy girlfriend(s). 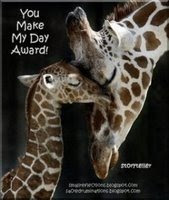 You give them the award to thank them for their special friendship. Now go check my "Sisters" out. 4) And, of course, another levy will be put to the vote in May. The economy is really bad with no relief in sight any time soon. Naturally, people don't want to vote for tax increases. The schools are just going to have to realize this and adjust. When I was in high school, I had to take three buses and walked a few blocks, thinking nothing of it. I don't see what the big deal is here. What do you think about this huge tragedy? Your comments are welcome. This was a tremendous study on faith this week that really spoke to my heart and helped me to see that God is faithful and believable which encouraged me in my faith. Faithfulness is believing the reality of a sovereign God. Hebrews 11:6 says And without faith it is impossible to please God, because anyone who comes to him must believe that he exists and that he rewards those who earnestly seek him. 1) Our faith hinges on our belief in God's faithfulness. Realizing that God is believable is the key to faith. Since it is by grace we are saved through FAITH, and not of ourselves, it is the gift of God according to Ephesians 2:8, it's no wonder we can't prove there is a God. God planned it this way. If we could reason everything out and science could prove there was a God and creation, where would faith come in? Hebrews 11:3 says, By faith we understand that the universe was formed at God's command, so that what is seen was not made out of what was visible. This whole concept was an eye opener for me, to realize that God purposely doesn't answer all our questions or provide concrete evidence for everything so that it's only by faith that we can believe. Faith is really quite simple, it's just believing what God says is true. We come to God only by having a child-like faith in Him. In Matthew 18:3, Jesus is quoted as saying, I tell you the truth, unless you change and become like little children, you will never enter the kingdom of heaven. The Old Testament prophecies that are fulfilled in the New Testament makes God believable. 2) Our faith needs to be based on Who God Is and not on What God Does. A faith based on what God does will fluctuate based on whether or not God does or acts like we think He should. If he answers our prayer the way we want, then our faith increases, but if not, our faith is shaken. If something bad happens that we think God should have prevented and didn't, our faith is shaken. To me, I am glad our God is greater than us and wiser than us! 3) True faith takes action. To see this, all we need to do to see this is read through Hebrews 11 which is called the "Hall of Faith." 4) Fight the good fight of faith. Satan uses two weapons to destroy our faith: fear and familiarity. Satan uses our fear to believe God, fear of disappointment, fear that God might not "prove" His love to us, and our fear of humiliation to destroy our faith. Sometimes those who have known God the longest put limits on Him by only asking for "safe" things that don't take much faith. When we are filled with the Holy Spirit, he gives us the characteristic of faith to believe God completely and use the "shield of faith" to quench all the fiery darts that Satan throws at us. Yes, when I was at an Cleveland Indians game with my mom and my best friend and sisters and brother we held up a large PEANUTS sign that said "Charlie Brown says Go Indians! It was about 4-5 feet long and about 3 feet high. It had several of the PEANUTS characters on it and we just put a strip of writing across the top. Yes, a long time ago when Pastor Lanpher organized a youth choir and convinced my mom that he wanted me to join in even if I couldn't carry a tune. I sang the alto part and enjoyed it, but don't know if he regretted his decision to encourage me to join or not. I really do sing off key and don't even know it. I did enjoy making a "joyful noise" to the Lord and sang out anyway. I think I was in Junior High school at the time. My mom warned him! Oh yeah, I can think of several, but probably the one I really hated most was a dress that I got from Christmas when I was little. I even let the person know right then and there. I was just being honest, hadn't learned to be tactful and still have some trouble with that. See my earlier post, "Warning, Tip For Parents." A lamp post, no, but I have walked into low tree branches and door jams quite often. Does ordering pizza count? If not, then I have to say no and I seriously doubt I ever will. Yes, twice fairly recently even. Once when I was crossing the street to catch the bus, I fell right in the street while running for the bus. My umbrella tripped me. My feet were running left in the direction of the bus, but I was looking right for oncoming cars. Fortunately, I fell right in the middle of the street in the turn lane! Then I ran in front of the bus and it almost hit me because the driver didn't see me, but I made it even without any broken bones! (You can read about all the details at "Bus Adventure." Another time I was going outside for lunch and was walking along reading a book, missed a step coming out of our building and sort of ran along to try to keep my balance and avoid falling which I was successful in doing, but not before Leaking in my pants in the process from the extra exertion. Of course people were all over the place. but no one said anything. Yes, quite a bit--it's so much fun and very rewarding and satisfying! My first volunteer work was helping kids do crafts in "Hobby Club" that our church had on Saturday mornings as an outreach for the neighborhood children. At that time we had a Pastor's wife that was really gifted in the are of making crafts, often useful things, out of . . . well, I guess junk. Stuff like cans, OJ containers, yarn, rocks, wallpaper samples, carpet samples, just about anything. Then, I started helping in Vacation Bible School ("VBS") and the first time I ever taught was a first grade VBS class. I remember sewing some headbands to stick colored paper feathers in for them when they said their verses. I liked teaching and started teaching a 3rd grade boys' class. I also played the piano for children's church. I've taught grades 3-12 for Sunday School, started a group called Whirlybirds for grades 4-6, directed the youth group for about 15 years with grades 5-12 and even while at Malone College, I taught a Bible Study for a few Jr. High girls. I used vacation time to volunteer as a camp counselor at Beulah Beach for a couple weeks during summers before I got married. I started off with high schoolers but also did Jr. High and 10 and 11 yr. olds too. This was very fun, but very exhausting! When the Billy Graham Crusade came to Cleveland, (I think it was in the 70s or 80s, I'm sure exactly when), I took some vacation time to volunteer to type the cards that were sent to area churches for follow-up on new believers. I wound up heading up that department and working until 4 a.m. This was a fun experience and I remember they had a LOT of food brought in for us to help us stay awake and energized. I was one of the first who worked in the AWANA club ministry at church when it was first started. I was the secretary for all the groups. Later, I became a director for 3rd & 4th grade girls and boys, a leader for 5th & 6th grade boys, but my favorite position was Commander/Secretary. When we changed churches, I really missed AWANA so helped in Pioneer Girls for a couple years, it just wasn't as good though. I joined the puppet team when Cindy started one at the Brooklyn Christian & Missionary Alliance Church and now currently do it with my husband at Parma Heights Baptist Church ("PHBC"). Most recently Gerard and I do VBS and Sports Camp for a couple weeks during the summer at PHBC. I teach the 5th grade boys Sunday School class. Once I retire, I look forward to volunteering at a local animal shelter and perhaps the Cleveland Zoo in addition to church activities. Have fun and pass this along to four or five more. Any questions about any of my answers? Sadly, I learned that the Carousel Dinner Theater in Akron, Ohio has closed. I feel bad for all the people who worked there and for the season ticket holders who now will not see any of the shows scheduled. Gerard and I only went twice but enjoyed it both times when we saw "Annie, Get Your Gun" and "Seven Brides For Seven Brothers." Their last performance was sold out. Touch the muscle you are working as you work it if you can. Stand and walk around a bit between sets when working the legs. (I also am learning some things about posting from Blogging For Dummies. Several times I've wanted to make a bullet point list in a post but didn't know how. That's one thing I learned how to do this week from reading this book. 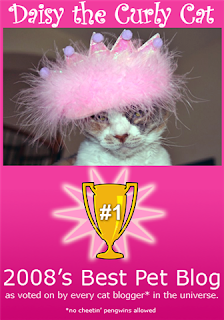 I never realized photobucket had such cool features to use with your photos until I saw this post at Purrchance to Dream. You can put your photos in frames or on posters and use a lot of different effects. Here is a sample picture of mine that I played with so show you. When reading Daily Blog Tips, I found out that it's a good thing to link to older posts in your blog not only as a help to the readers but also in light of search engines. I've done this some when I do an update post or if I am referring to something I've written in the past. That's when that search widget comes in handy--I love it! Anyhow, I will plan to do a post about what I think are my my most popular in 2008 and some early posts that I think were good but didn't get a lot of comments perhaps because it was early on in the life of this blog. According to a post I read about apples at Health Nut Wannabee Mom, eating apples may help prevent Alzheimer's and Parkinsonism. I never heard this before but really think I will add those Delicious Red apples to my diet this year. Thanks to my wonderful blogging friend, Mountain Woman at Red Pine Mountain, I learned that I can have my blog connected to Facebook so friends on facebook can follow it there. 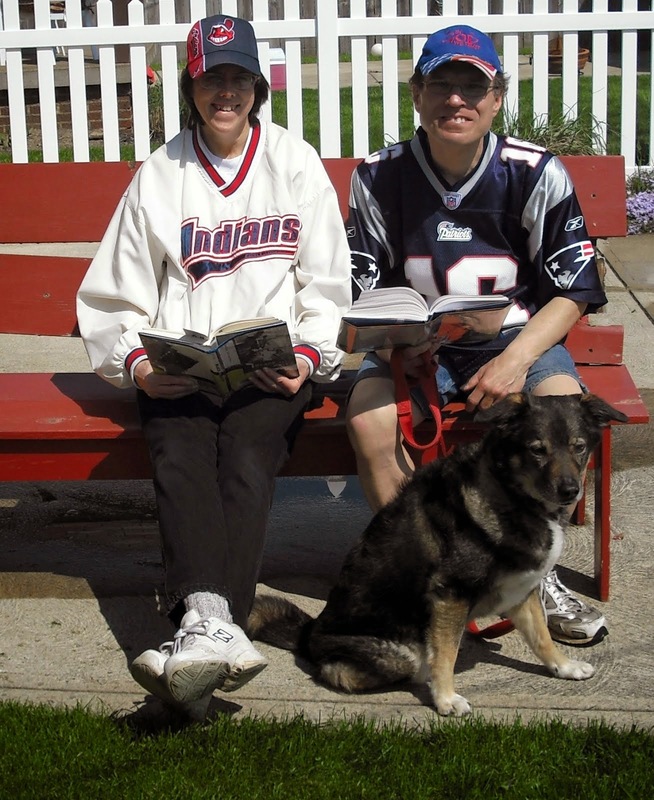 If you are on Facebook, look me up and join my blog "neighborhood." It's the Networked Blogs badge in the right sidebar. STICKERS - Our kids love putting stickers everywhere and the easiest way to remove them is to soften the adhesive with heat using a blow-dryer. Do it for 10 to 15 seconds, then peel. If necessary, just repeat the process. For stubborn gunk, dampen a cotton swab with laundry pre-wash stain remover and rub until it penetrates the residue, then use an old credit card or spatula to scrape it off. Wipe the area with a damp cloth and let dry. I am pleased to report that it really works! Now my dresser is monster free and it only took about 20 minutes, if that, once I got all my "tools." Thanks, Modern Mom! For more great tips, stop by her blog at http://wondermom.info/. Here is a short video showing me actually doing it. This post is linked to Mama Kat's Writer's Workshop in response to the prompt: Has the internet inspired you? Share a tip, recipe or craft you attempted after seeing it posted on the internet. Gerard likes Snoopy and when we were in Penny's, he saw this shirt and pointed it out to me. It was very cheap so I got it for him. He works at a place that sells musical toy instruments and thought this would be a good shirt to wear there during the holiday season. The Patriots Santa hat he got a few years ago. He often says how tired his feet are and how sometimes they hurt. I found this foot massager at Brookstone and tried it out. It feels really good so I got it for him. He kept wondering what I found for him at Brookstone, the store where he bought me my photo scanner and a portable digital photo album. 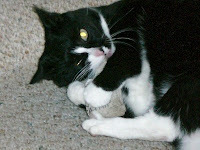 Although this one doesn't show Manny paying much attention to the shoestring, he actually did as you can see from shoestring racing video posted on the cats' blog at Zemeks Updates (Cat Corner-MEOW section). I had to wait for the cat grass to grow before we can see if the cats prefer it over the shoelace. I'm happy with how it grew. 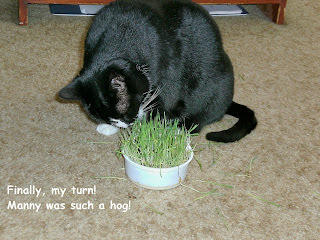 The best of all is the cat grass! They not only liked eating it but also liked pulling it out, making a mess and batting it around. Even other days, I could tell they were at it when I got home from work because it was knocked off the table and dirt was on the carpet! They obviously had some fun while I was gone. So, if you choose to get some for your cat, put it where it's easy to clean up and don't be surprised if they make a mess. It looks like only two people got it right in our little poll at top. The wrapping paper got the most votes, but actually they didn't play with that for very long. This was very difficult because we read so many good books this year. I feel bad that I couldn't fit Breakfast At Sally'son my list. Kindness works together with goodness. The good works that God has prepared for us to do should result out of kindness towards others. Sometimes what is good may be painful, but it is always beneficial. The illustration used was when parents correct their child, it's for the child's benefit but not necessarily pleasurable. The tenderheartedness towards their child balances the correction. Basically, when we are filled with the Holy Spirit, the kindness will motivate us to do good works. Goodness is actively doing good! My good work the day before writing this was preparing for my Sunday School lesson, praying for some of my blogging friends who are going through difficult times and bringing a cookie home for my husband from my Bible Study. What good work will you and I do today? 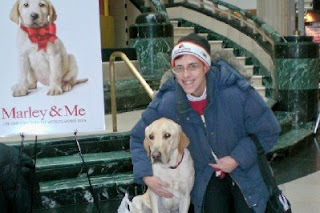 Tuesday we went to see the movie "Marley & Me" and enjoyed it very much! It is very close to the book, but in the movie, I liked the people better than in the book. The wife seemed nicer and they cut out the part that made me angry at the owners near the end of the book when they went on vacation when Marley was in such bad shape so I actually liked the movie better. Also, the parts in the book that dragged about his job didn't drag in the movie. Although the ending is predictably sad, both my husband and I still cried. I don't think there was a dry in in the whole theater! You know when a movie touches you like that, it's a good one. Of course the fact that we watched it the day before the anniversary of our cat, Moe's, death brought back memories of those sad days when Moe lost his get up and go. I'm sure anyone whose experienced the death of a pet will relate. 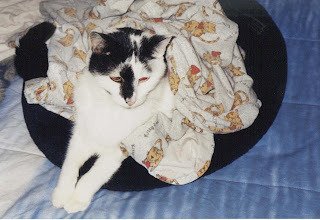 For Moe's story, here's the link for it if you have some time: Our Miracle Cat, Moe. The dogs played their parts as Marley extremely well too. I'm amazed that the director and trainers could actually train a dog to do those things on cue! My favorite part was when they took Marley to dog training and he got kicked out when even the instructor couldn't get the dog to heel! Most of the movie is very funny an the puppy dog is way cute! We highly recommend this family movie and would love to hear your comments if you've either seen it or read the book. We went to the zoo on Saturday and met a new little animal that one of the volunteers was holding. It's about the size of a chipmunk with very big eyes and a membrane that makes it so it can glide through the air 60 feet like a kite. The big eyes are a sign that it is a nocturnal creature. It's comparable to our flying squirrel. She said it lives in Australia. Any guesses? It's called a sugar glider but does not eat sugar. It's very soft with sharp teeth and claws. Picture is from Wikipedia since I didn't have my camera with me. Check out this link for more information: http://en.wikipedia.org/wiki/Sugar_Glider. At The Modern Mom I found a whole list of "Stain No-Nos" which included some things that I never knew I shouldn't do such as "Don’t rub soap into fresh stains, it will only set stains" and "Don’t tumble-dry stained fabric, the heat will only set remaining stain permanently." The source she noted was "quick & Simple." Win at least one set of tennis from Karen. Don't break anything when cleaning. Don't take losses by my teams so hard. Last year's resolution for me was to be a blessing to someone each day. (I think I did pretty good on this one and will use it again for next year.) Also, for me to grow closer to God and get back in shape. I already listed some definite goals in the prior post, "Smart Goals." We, the Zemeks, hereby declare 2009 as the "Year of Saving" since 2008 was a "Year of Spending." Need some help in coming up with some resolutions for 2009? Take this little quiz and see what resolutions it says you should make. Then share them in the comments here. Here are the ones it says I should make--getting fit is definitely one I am making! What Should You Resolve to Change Next Year? Click here to find out! Wow! We thank all our December commenters for their participation on my blogs. This is the most commentators we've had since we started blogging. It seems we are getting more and more comments every month! We enjoy your comments and hope you find things of interest here. This list also includes those who commented on my other blog, My Funny Dad, Harry last month. Guy's Wife, Jennifer at Jenn and Randy and Chris at Our Dog Log left comments on our PNN blog at http://karen.pnn.com (Zemeks Updates). If you haven't visited that one yet, it's a whole different look and format broken down by specific categories with mostly different posts than here. If you made a comment on here during December, you should be listed. If you aren't it is just an oversight on my part and not intentional. Please let me know if you should be listed and I will add you on. Mountain Woman at Red Pine Mountain (Thanks for the wonderful recommendation for "My Funny Dad, Harry" blog! Since this is getting to be quite a chore with so many, in 2009 I may just give link love to the top ten. I do like to reward my commenters somehow. I use this list to do Entrecard drops as well so that way I make sure to visit your blogs on a regular basis--(even when Entrecard is having issues).